Posted on 21/04/2019 by U.N. 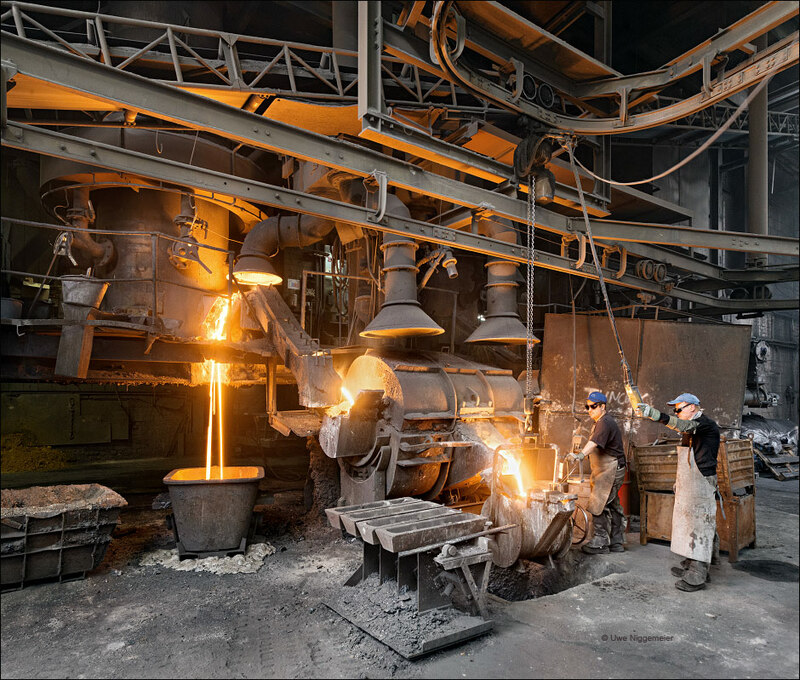 The Gienanth iron foundry in Eisenberg, Germany, founded in 1735, is one of the oldest working industrial enterprises in south-western Germany. 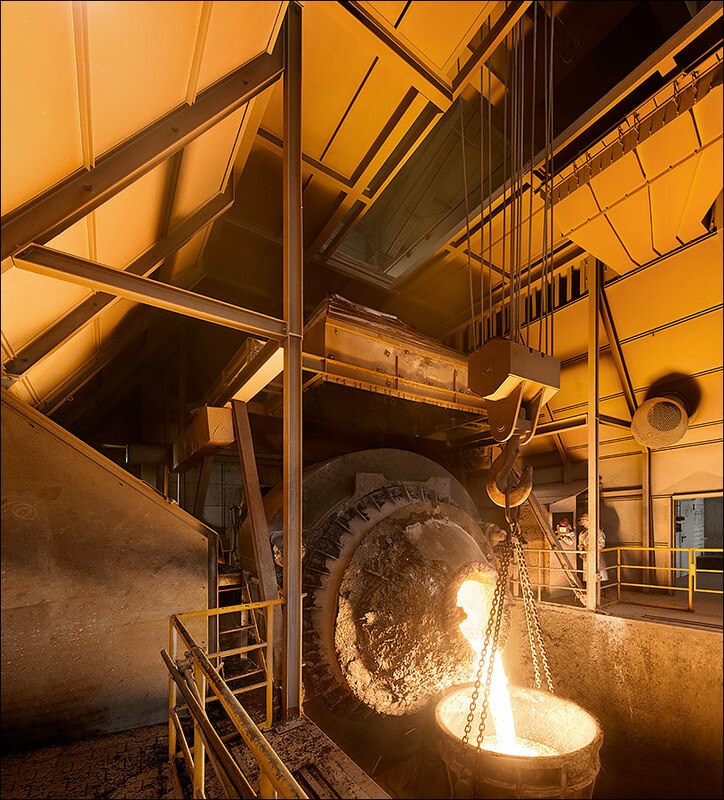 Today the foundry runs a 30t/h hot blast cupola furnace, installed in 1978, four induction furnaces and three 60 ton holding furnaces. Major products are blocks for stationary and ship diesel engines. Posted on 23/01/2019 by U.N. Almost unnoticed another tradition-steeped company passed away last March. The former Buderus Spezialguss in Wetzlar, Germany went bancrupt after casting iron for more than 100 years. Posted on 09/01/2019 by U.N.
Geweke Guss, formerly known as Eisenwerk Geweke, the last melt shop in Hagen, my hometown, closed for good. Posted on 15/05/2018 by U.N.
Way up north right beside the seashore lies Germany’s largest steel foundry. 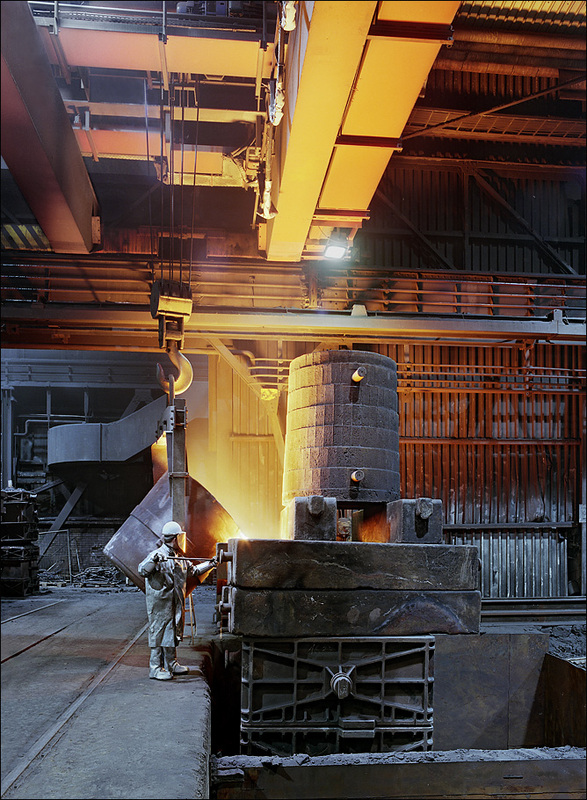 Sande Stahlguss produces steel castings up to 45 tons a piece. 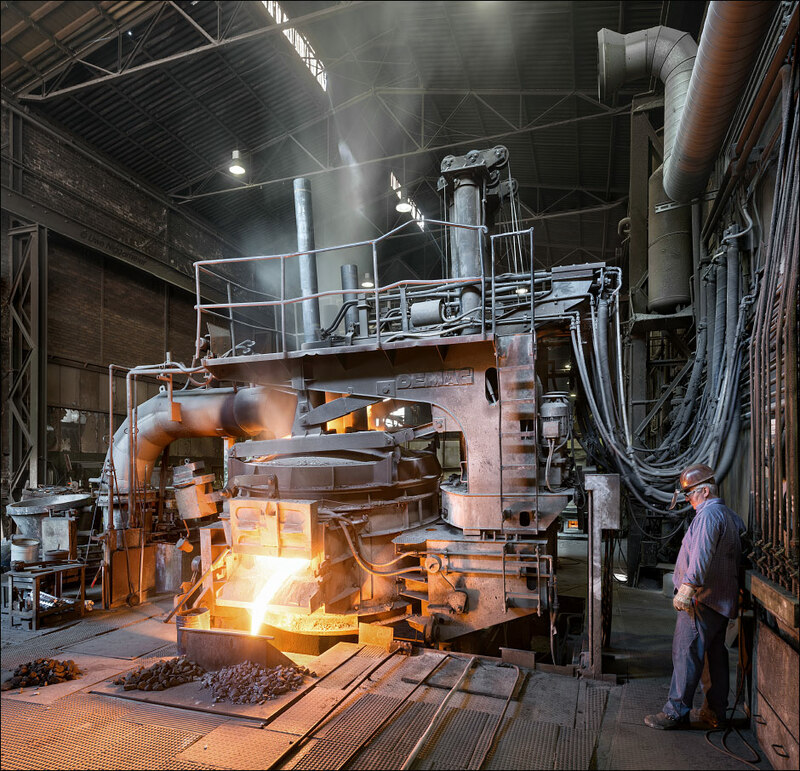 The foundry runs two electric arc furnaces and a 45 ton AOD-converter for highly alloyed steel grades. Posted on 21/04/2016 by U.N. 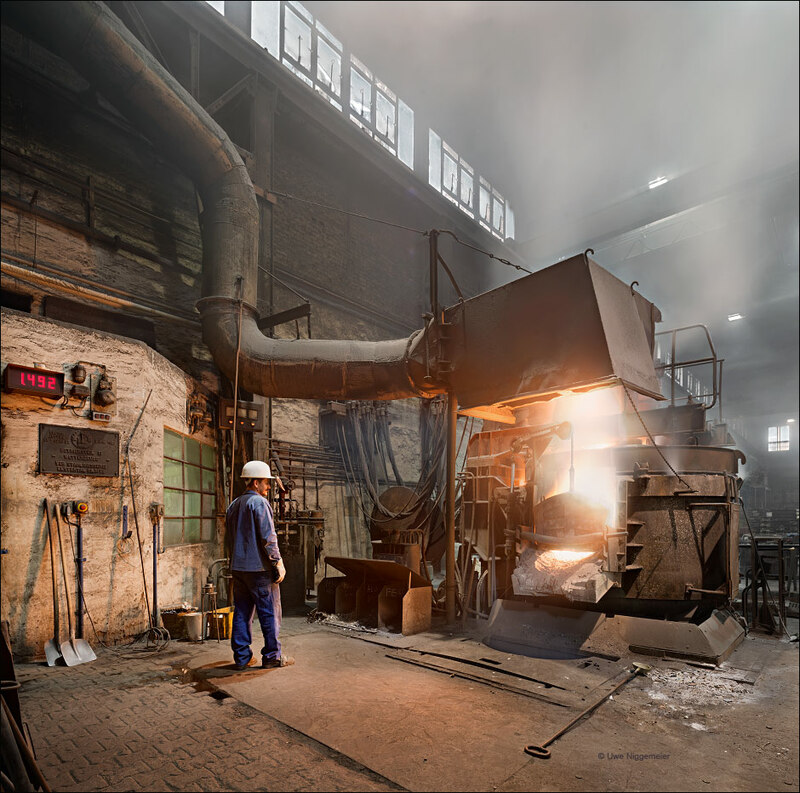 The C.Grossmann foundry in Solingen, founded in 1853, made it’s last casting on Friday. Posted on 20/07/2014 by U.N. The steel foundry in Wetterzeube, Germany was founded in 1909 named „Stahlwerk Staeglich und Haberkorn Wetterzeube“. The foundry operated a cupola furnace and two crucible furnaces. These were replaced by an open hearth melt shop in 1921. After the war the Wetterzeube works were nationalized and became part of the “VEB Stahlgiesserei Elstertal Silbitz” foundry combine in 1955. 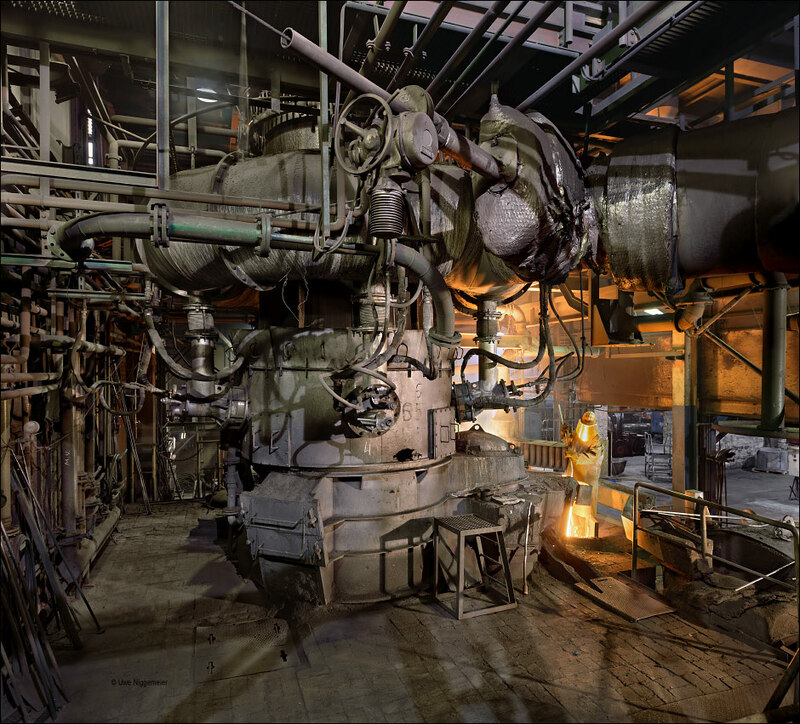 In 1985 a 5 ton electric arc furnace, built in the 1950ies and relocated from Bösdorf near Leipzig, was installed. After the privatization the Wetterzeube foundry became part of the GEW Gestaguss group from Velbert, Germany. Posted on 02/01/2014 by U.N.
Velbert, Germany in the 1960ies was a busy town mainly living of it’s more than 30 foundries. 7000 people produced mostly small iron castings for household appliances, keys and the car industry. Gestaguss is the last survivor of this once thriving business. The Gestaguss foundry in Velbert was established in 1919 under the name Bergisch-Märkisches Eisenwerk (BME). The BME specialized in malleable iron castings. Domestic appliances like meat grinders were built at their own workshop. After 1990 the foundry filed bancruptcy several times and was taken over by the Gestaguss group in 2011. 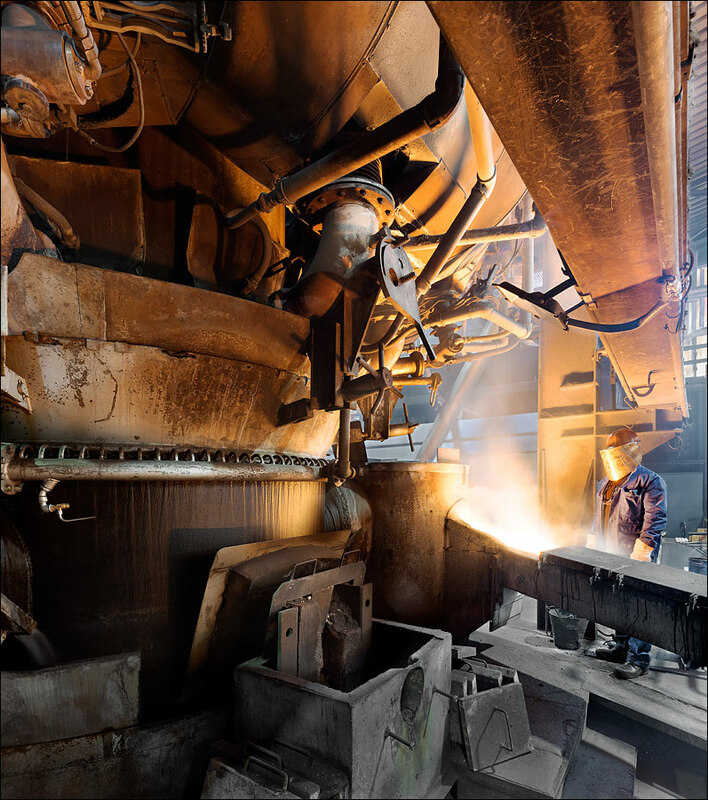 The foundry produces castings with a weight of up to 30 kg from two cold blast cupola furnaces. 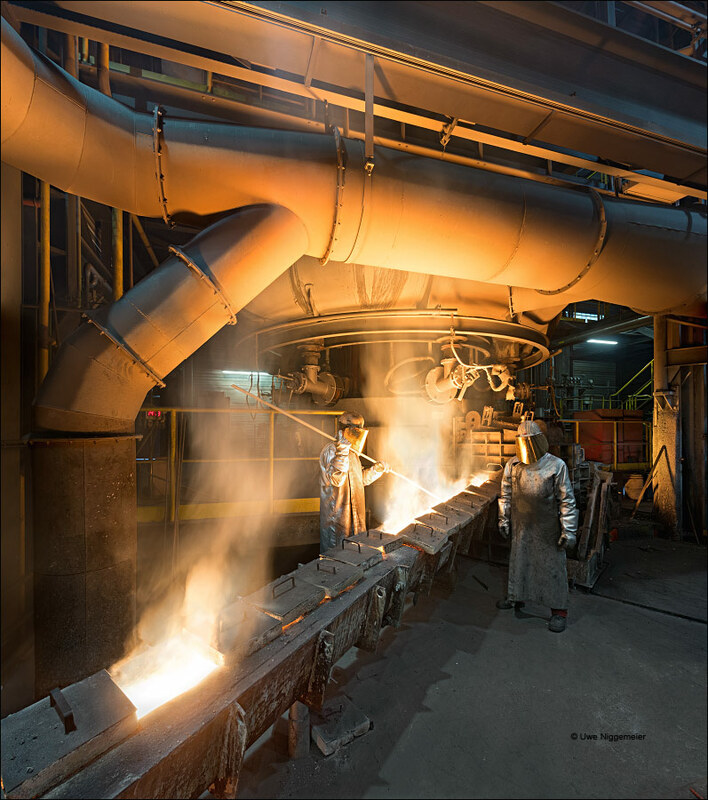 It is one of the last malleable iron producers in Germany. Posted on 01/12/2013 by U.N. The Walter Hundhausen foundry was established in 1914 in Gevelsberg, Germany. After WWI the company moved 25 km to Schwerte at the eastern edge of the Ruhr area. In 1928 the production of black heart malleable castings started. Heavy truck axle components became a main product after WWII. Walter Hundhausen was taken over by the Hoesch steel company from Dortmund in 1989 and became part of Krupp Hoesch Automotive four years later. 1993 closure of the branch plant in Werdohl. 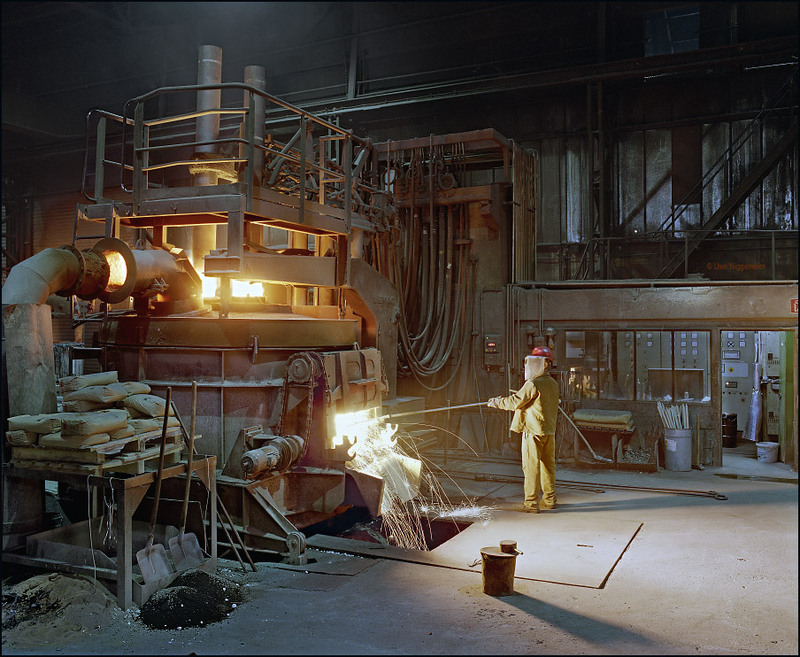 In 2000 the Walter Hundhausen iron foundry was taken over by the GMH group from Georgsmarienhütte. 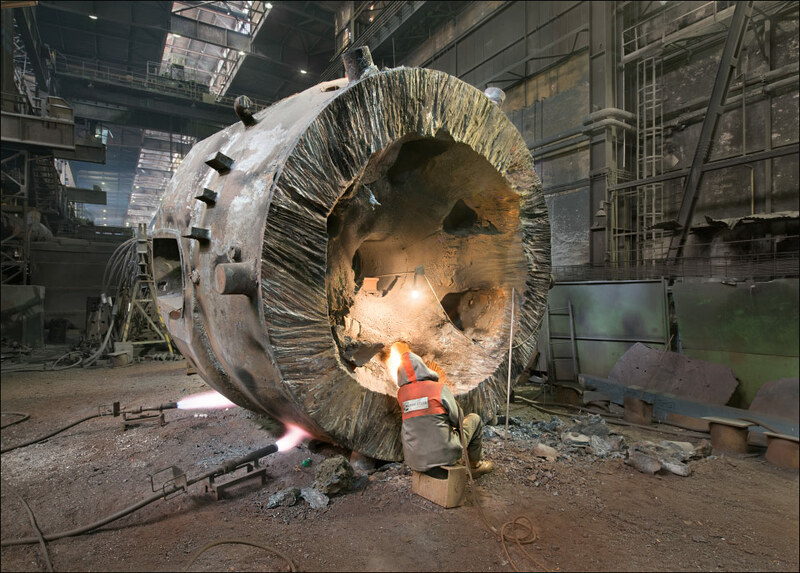 A new large 40t/h cupola furnace replaced the old induction furnaces in 2008. The foundry employes more than 600 people. Posted on 21/10/2013 by U.N. This is the old Carlshütte in Limburg, Germany, better known as Buderus Eisenwerke for more than a century. The company was founded in 1900 by Carl Schlenck from Nürnberg. In 1907 the Buderus company took the mill over to produce sewer and drainage castings. Four cupola furnaces were installed. During world war II. a converter for steel castings was in use. During the 1950ies and 60ies more than 1200 people were employed. In 1979 a new hot blast cupola furnace was built. In 2009 the former Buderus Kanalguss was bought by the MeierGuss group.